Thomas Farley, Philadelphia's health commissioner, shows what the amount of sugar in a 64-ounce soda looks like – 58 sugar packages, totaling 800 calories – at a news conference Monday, May 23, at the Puentes de Salud health clinic in South Philadelphia. 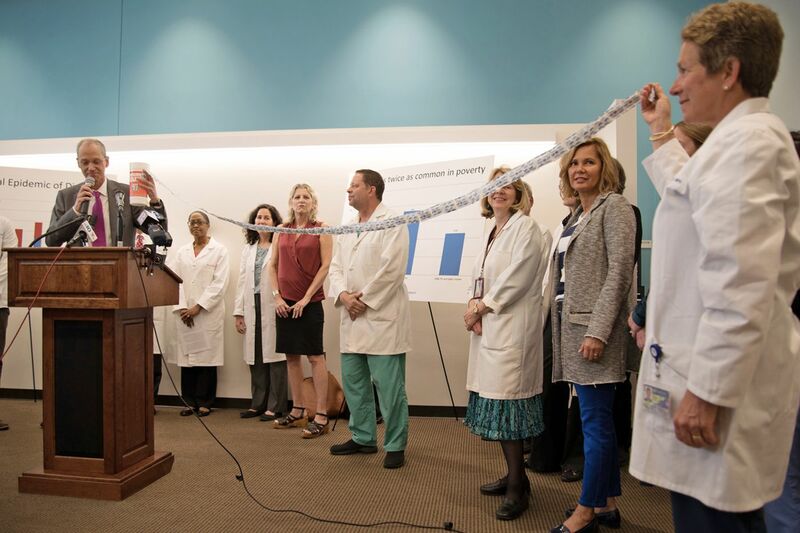 About 20 doctors and nurses from across the city gathered at a South Philadelphia health clinic Monday to declare that their patients' health would improve dramatically if sugary soda were taxed. Like a (somewhat unpolished) magician conjuring sugar hidden in a giant cup, city Health Commissioner Thomas Farley reached down and pulled . . . and pulled . . . and pulled until he had revealed 58 linked packets of sugar representing 800 calories - more than a third of the total daily calories that most people should be consuming each day, he said. Mayor Kenney's proposed tax would add $1.92 to the cost of that 64-ounce drink. At the news conference, however, Farley and others said that increase - if distributors passed the entire amount to consumers - would help reverse a growing epidemic of diabetes. Diabetes now affects 15 percent of Philadelphia residents, including nearly one in five African Americans. Most of it is lifestyle-driven type 2, which was virtually nonexistent a half-century ago. Critics have argued that the proposed tax of 3 cents per ounce would disproportionately affect low-income residents, who drink more sugar-sweetened beverages than the more affluent. Farley's response: "Diabetes is regressive." Marisa Rogers, a physician of internal medicine at the University of Pennsylvania, recounted her experiences with two diabetic patients. One, in her early 60s, worked for years on diet and exercise, and finally succeeded in getting off all her medications. The other, in her 40s, had more difficulty and recently had her second leg amputated. "Let's face it, changing your behavior is really hard to do," Rogers said, noting that a tax on sugary drinks would give her patients added incentive to switch from sugary sodas to healthier beverages. "We live in a world where a bottle of soda is cheaper than a bottle of water." The news conference was organized by Philadelphians for a Fair Future, the main coalition supporting Kenney's proposal to tax sugary drinks in order to raise $400 million to pay for universal prekindergarten, expanded recreation, and other services. Those programs also would have health benefits, several speakers said. But the biggest plus for health would be the reductions in obesity, diabetes, and cardiovascular disease that they said would follow a decrease in sugar consumption. Among the speakers was Steven Gortmaker, a Harvard public health researcher, who projected last month that the tax would eventually prevent 36,000 cases of obesity a year and 730 deaths over a decade in Philadelphia. He said it would drive down sugar intake in much the same way that tobacco taxes, along with changing attitudes, drove down smoking rates and, with them, cancer. The health professionals lined up in front of two large posters with national diabetes statistics. One showed that Americans living below the poverty level were twice as likely to have diabetes as those with double their income (22 percent vs. 11 percent). The South Street clinic where the event was held serves a largely low-income, immigrant population, many of the people undocumented and uninsured. In moving to the United States for a better life, many of the patients also changed from what was a healthier diet in Mexico - "they ate what they grew" - to more processed foods, said Steve Larson, cofounder and executive director of Puentes de Salud, whose name means "Bridges to Health." The 2015 Southeastern Pennsylvania Household Health Survey shows that 24 percent of all adults in the clinic's zip code, 19146, say they have been diagnosed with diabetes - roughly double the national average and two-thirds higher than Philadelphia as a whole. Larson said he sees the cardiovascular effects of that diet in patients both at the free clinic and in his day job as an emergency physician at Penn. "They can't afford to end up in an ER that charges $3,000 in a bill - one-third of their [annual] income," Larson said.